manipulate the social web all by yourself | Abler. Facebook’s experimentation with its users’ feeds was a big story this summer. And last week, tech writer Tim Carmody pointed to the curiously less-scandalous news that online dating site OKCupid has done the same thing with its data. Early last week, as a guest writer for Kottke, Carmody considered the differences between the two platforms and the forms those interventions took, and why the press so far has varied widely about the news. In the later part of the week, he returned to the discussion with a detailed analysis of both cases, getting beyond both simple outrage and a shoulder-shrugging, you’re-the-product cynicism. 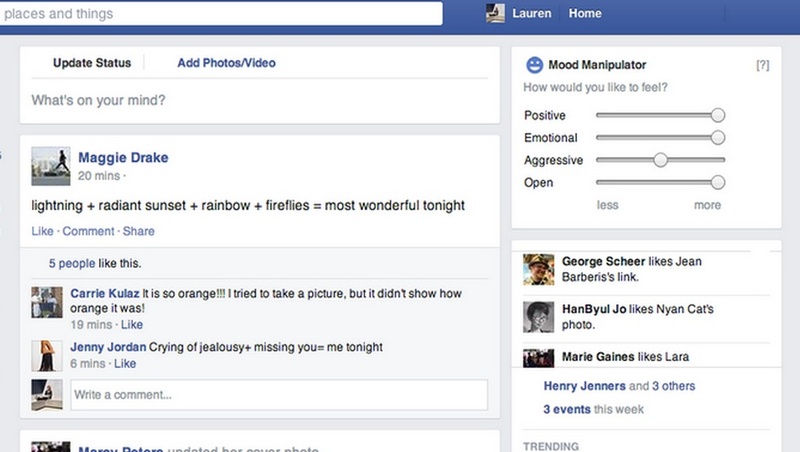 I’ve long loved Lauren McCarthy’s work, so I took note of her Mood Manipulator Facebook plug-in—a small set of tweaks for tuning the mood of your feed all by yourself. 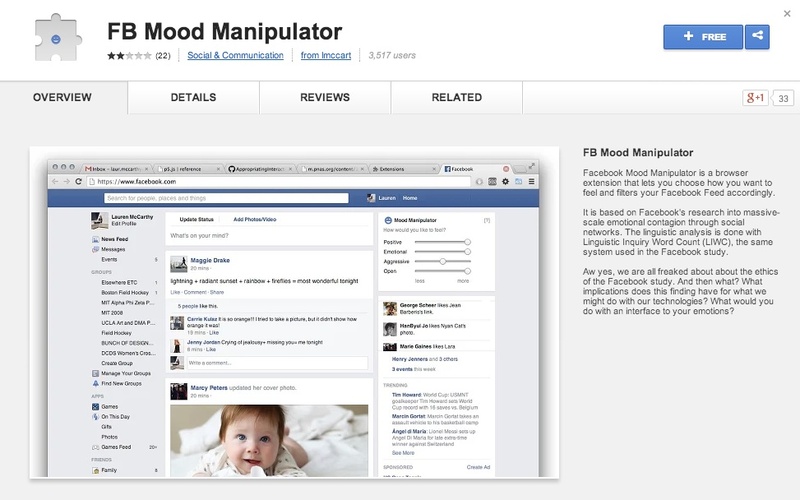 The manipulator makes a small widget in the upper right corner of a user’s Facebook screen, asking her to indicate emotional wishes with sliders, to amplify or inhibit certain kinds of moods. Users can dial up or dial down their wishes for “positive,” “emotional,” “aggressive,” or “open” inflections in their feeds. “Everyone was talking about the ethics of the study, and few people were talking about the actual implications of the findings. Of course, the paper didn’t contain a ton of surprising results, but just to be thinking about how the technologies we build affect our emotional state is important. This sort of research happens in academia, but to see it enacted in a large-scale, actual system we interact with made the results affecting for me. See more of Lauren McCarthy’s Mood Manipulator.